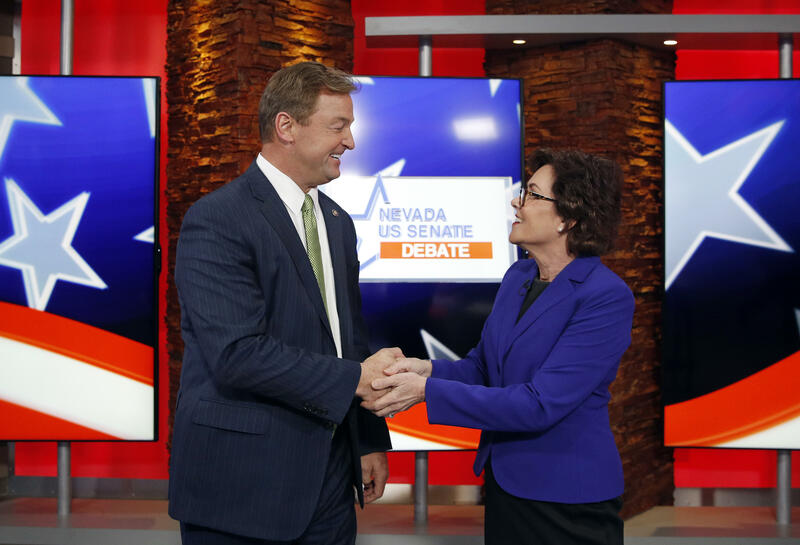 Heller and Rosen traded accusations of untruthfulness, and interrupted each other throughout their debate Friday night. Heller is considered the most vulnerable GOP senator running for re-election this year because he's the only Republican senator running in a state that Democrat Hillary Clinton won. Democrats are hoping a backlash to Mr. Trump will propel their base to the polls and carry Rosen to victory in battleground Nevada. Both candidates touted their ability to work across the aisle, though when asked what could be done to ease a partisan standoff in Washington, Heller took a page from Mr. Trump's playbook by blaming the media for political divisiveness. Heller's campaign spokesman Keith Schipper said later that the candidate had to leave to get to Elko, where Mr. Trump is holding a rally Saturday. At a KLAS focus group of undecided voters after the debate, participants were mainly along party lines. Independents viewed Rosen's remarks on border policy favorably, while they also reacted in favor to Heller pushing for increased care for U.S. veterans, KLAS reports. Rosen is reporting she collected an eye-popping $5 million in campaign donations during the first 17 days of October. On Friday, she announced her fundraising totals for the last campaign finance reporting period before the Nov. 6 election. The freshman congresswoman has outraised Heller every quarter since jumping into the race. Heller's campaign did not immediately respond to a message inquiring if his fundraising totals were available early as well. The reports are not due until Oct. 25. Heller has closely tied himself to President Trump throughout the campaign. He described himself as "99 percent" against Mr. Trump before the 2016 election, and Mr. Trump threatened to support a primary candidate against Heller in early 2017. However, facing the threat of a primary, Heller became a prominent supporter of the president in the past year. Although he initially opposed the repeal and replace of the Affordable Care Act, Heller then hopped on board, supporting an amendment which would have seriously constricted Medicaid access. Rosen is a first-term congresswoman and a former synagogue president representing southern Nevada and the suburbs around Las Vegas. She has made health care a centerpiece of her campaign, and has repeatedly hit Heller for voting to repeal and replace the ACA. She is vacating her congressional seat to run for Senate, and the open seat is competitive. The CBS News Battleground Tracker rates Rosen's congressional district as "Lean Democratic." Recent polls have shown the race between Heller and Rosen tightening. Although a CNN poll from early October showed Rosen leading among likely voters 47 percent to 43 percent, an NBC News/Marist poll released the following week showed Heller leading Rosen among likely voters 46 percent to 44 percent. A recent New York Times/Siena College poll also showed Heller two points ahead among likely voters. The CBS News Battleground Tracker rates the race as a "toss up." Mr. Trump visited Las Vegas earlier in October to rally for Heller and other statewide Republican candidates. The president criticized Rosen at the rally, saying that she would never vote with the president if elected to the Senate. "Remember this: Dean's Democrat opponent -- Wacky Jacky -- she doesn't get it," Mr. Trump said. "She's going to do whatever Pelosi and Schumer tell her to do," he said, referring to Senate Minority Leader Chuck Schumer and House Minority Leader Nancy Pelosi.